This essay comprises in the main of a running commentary of "The acts of the witnesses" and its mainly anti Muggletonian commentary does not add much to a study of Muggletonianism. 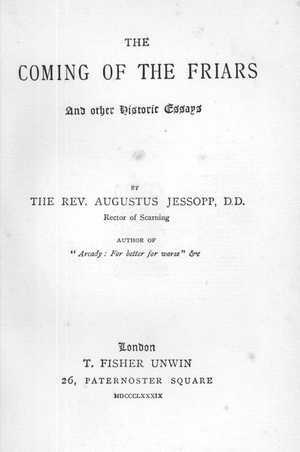 The volume contains many errors and William Lamont reports that the great Muggletonian Thomas Robinson wrote to Jessop explaining his dissatisfaction with both the contents and tone of Jessopp's work. Jessopp is said to have responded in a "bluff and conciliatory way". "When we come to the teaching of Muggleton, we find ourselves in a tangled maze of nonsense far too inconsequential to allow of any intelligible account being given of it." This smacks of Jessopp not being astute enough to get behind the broad currents of Muggletonian thought, or perhaps more charitably he did not have access to the Muggletonian works that would enable such topics to be properly understood. "There were two men in England who were quite certain - George Fox was one, Muggleton was the other. Everybody else was doubting, hesitating, groping for the light, moaning in the darkness. These two men knew, other people were seeking to know. George Fox went forth to win the world over from darkness to light. Muggleton stayed at home, he was the light. They that wanted it must come to him to find it."